There will be no workshops during the winter months as the studio is only a 3-season space. Workshops generally run from April to October, weather permitting. Please check back from time to time as new workshops will be added regularly, or contact me to be added to my newsletter update list. Three sessions of classes per year, Felted Art Level One is 6 weeks, Felted Art: Jewellery & Decor is 4 weeks. 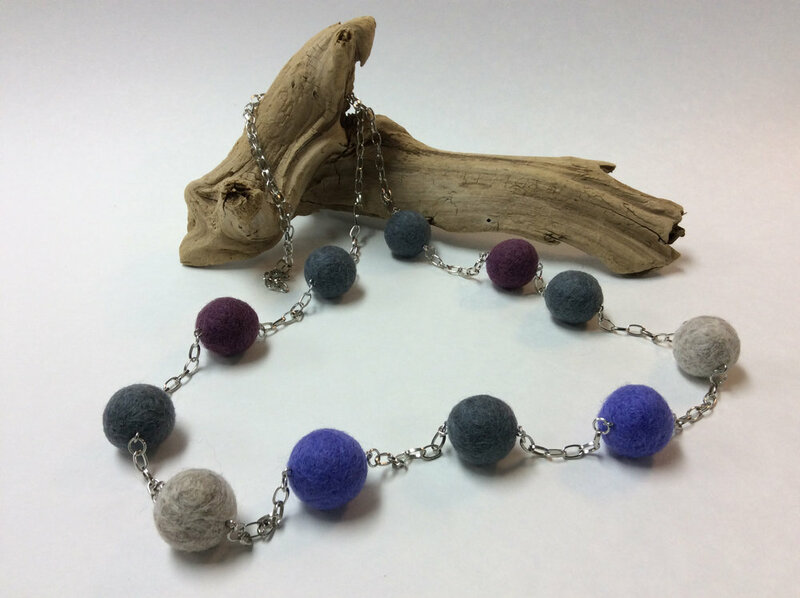 The next set of classes for Felted Jewellery are starting March 4 and run 4 weeks. Right after that is Felted Art Level 1, which runs every Monday afternoon from April 1 - May 13. To check out and register for the city-run classes, go to this link, scroll down to “Textiles, Fabrics and Yarns” and click on “Show Courses”, then scroll down to find my classes. Are you interested in a specific workshop or date for you or your group that you don't see here? Are you interested in a workshop in your location? Please contact me! You will choose from coasters, bookmarks, a small purse or a glasses case. Come with friends, or come alone. Maximum 6 people. There will be a brief demo to get you started, then with guidance, you will create your own one-of-a-kind piece to take home with you that day. Have you ever wanted to paint with wool? Then this is a workshop for you! You will learn how to make a beautiful hand-felted tapestry out of wools and silks that you can frame & hang on your wall or use as a table mat or even a small throw pillow cover. Come with friends, or come alone. Maximum 6 people. There will be a brief demo to get you started, then with guidance, you will create your own one-of-a-kind tapestry to take home with you that day. Learn how to layer colour and how to create an image with wool. Learn how to make a beautiful hand-felted scarf out of the softest merino wool and silks blends. Come with friends, or come alone. Maximum 5 people. There will be a brief demo to get you started, then with guidance, you will create your own one-of-a-kind scarf to take home with you that day. Learn how to felt wool and silk onto a cloth base. Cost: $85 per person, no tax. All supplies included. Please bring a lunch. You will learn how to make a beautiful necklace and earrings during this full day workshop. All supplies including tools, findings and wool are included and you will go home with some amazing, one-of-a-kind, wearable art that will be the envy of your friends and family! You will learn how to make at least 6-10 beautiful hand-felted bookmarks out of wool, silks and funky yarns. Come with friends, or come alone. There will be a brief demo to get you started, then with guidance, you will create your own one-of-a-kind bookmarks in your favourite colours to take home with you that day. If you are with a book club, you can swap bookmarks at the end so you have a sampling of different colours and patterns. All workshop attendees get a 10% discount on any pottery and felted works or supplies for sale in the studio during your workshop! Felting supplies available for purchase in my studio! available for workshops or pottery/fibre art! Are you interested in a specific workshop or date for you or your group that you don't see here? Are you interested in a workshop in your location? Please contact me! "Thanks for a wonderful workshop yesterday. I really enjoyed working with you. You are a great instructor and I love your sense of fun and humour and I am happy with my finished product. You have a beautiful studio and garden and a keeper of a husband." - J.E. Thanks, Monika, for your patience & help in making my masterpiece! -S.R. Monika, you are a great instructor and I look forward to future workshops. You will learn how to make a beautiful hand-felted set of coasters out of wool, silks and yarns. Come with friends, or come alone. Maximum 8 people. There will be a brief demo to get you started, then with guidance, you will create your own one-of-a-kind coasters to take home with you that day. Interested in Faeries? Interested in trying clay on a simple project? Then this is a workshop for you! You will learn how to make a beautiful hand built faery door to adorn a tree, planter or to decorate a faery garden inside or out! Come with friends, or come alone. Maximum 8 people. There will be a brief demo to get you started, then with guidance, you will create your own one-of-a-kind faery door. Learn how to work with clay slabs and how to add decorations. NOTE: THIS IS A TWO DAY WORKSHOP. On DAY ONE, you will be making the door. It then needs to slowly dry and then get bisque fired. You will return on DAY TWO to glaze your creation and you will be leaving the door with me once again for the second firing and your door will be ready to pick up after that. Interested in trying a simple clay project? Then this is a workshop for you! You will learn how to make 2 to 3 beautiful hand built leaf plates! Come with friends, or come alone. Maximum 8 people. There will be a brief demo to get you started, then with guidance, you will create your own one-of-a-kind plates. Learn how to work with clay slabs to create a beautiful replica of nature! These will make a lovely Christmas gift for a special person on your list, or look stunning on your own table. NOTE: You will be leaving your plates with me to finish and can pick them up after they've been fired. On the day of the workshop, you will be making the leaves. They then needs to slowly dry and then get bisque fired. I will then glaze them and they get fired for a second time. You will be notified when they are ready for pickup. All supplies are included in the workshop. Please don't wear your best clothes as you may get some clay on them. Interested in trying a simple clay project? In sewing or knitting or crocheting or anything that might need a button? Then this is a workshop for you! You will learn how to make dozens of beautiful buttons - all the same or all different or sets of buttons! Come with friends, or come alone. Maximum 8 people. There will be a brief demo to get you started, then with guidance, you will learn how to work with clay slabs to create your own one-of-a-kind buttons. These also make a lovely Christmas gift for a special person on your list who loves to knit/sew/crochet! NOTE: THIS IS A TWO DAY WORKSHOP. On DAY ONE, you will be making the buttons. They will then needs to slowly dry and then get bisque fired. You will return on DAY TWO to glaze your creations and you will be leaving the buttons with me once again. The second firing will happen within a few weeks of the second day and can then be picked up. Please check back from time to time as new workshops get added regularly.